May 12th-Eto and Naito return! After a few days break action returns to Tokyo, where we see several notable fighters in action on the latest “Dangan” card. In the main event of the card fight fans will see former Japanese Super Featherweight champion Rikki Naito (13-1, 5) battle against Thai veteran Chaiyong Sithsaithong (40-15-4, 29) in a genuinely pivotal bout for the young Naito. The bout is key to the Japanese fighter as it will be his first bout following last year's loss to Kenichi Ogawa, the only loss of Naito's career so far. For Chaiyong the bout will see him return to Japan for the first time since his February loss to touted novice Shuichuiro Yoshino, who took a near shut out over the Thai. Interestingly the winner of this may find themselves thrust into an OPBF title fight before the end of 2016. Also looking to bounce back from a loss on this card is the popular Koki Eto (17-4-1, 13), who was last seen losing to Carlos Cuadras in a WBC world title bout. The exciting Eto will be looking to claim a win over Filipino Michael Escobia (11-11-1, 3), in what looks like a mismatch in favour of the local fighter. Whilst this shouldn't be a test for Eto we are expecting to see him show more boxing nous here than usual with the fighter stating that he has been working on making more of his jab in the build up to this fight. In an under-card bout the promising Sho Kimura (10-1-2, 4) looks to continue a 12 fight unbeaten run as he takes on the limited but heavy handed Yamato Uchinono (6-5-5, 4). Whilst Uchinono has lost 3 of his last 4 he is still dangerous and Kimura will have to avoid Uchinono's power if he's to come out on top here. Another under-card bout will see former Japanese Super Bantamweight champion Masaaki Serie (27-8, 10) battle against Keigo Soma (7-11-2, 4). Soma is perhaps best known for “retiring”Kohei Oba, who beat Soma but retired almost immediately afterwards, and although he's nothing special he has proven to be a good test. For the 33 year old Serie this should be a good test to see what he has left, but he's certainly a fighter who is a long, long way from his prime. Given how far Serie has slid this could be a very entertaining and well fought bout to prepare fans for the more significant contests higher up the card. The most notable action for Asian fight fans comes from Tokyo where the Korakuen Hall plays host to another Dangan card. 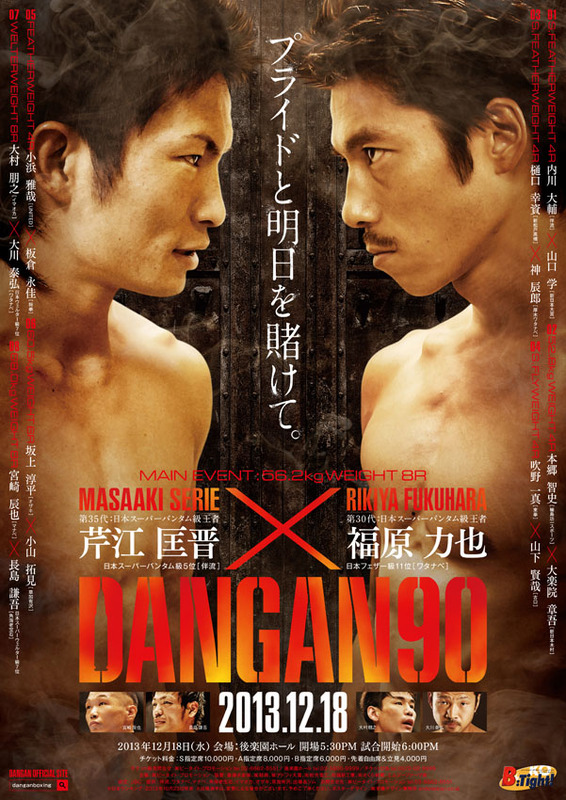 The card features a title fight, a bout between two Japanese ranked fighters and an intriguing cross roads fight. The main event sees Japanese and OPBF Middleweight champion Akio Shibata (25-8-1, 11) defending his belts against the under-rated Yasuyuki Akiyama (10-4-1, 8). The bout, originally scheduled for March, was rescheduled after Akiyama suffered an injury and although the challenger will still be the under-dog we suspect he'll be full committed to proving that he is the better man in the ring. Trying to prove that however will be difficult against the very talented Shibata who is on a 4 fight winning streak following his loss to then debuting Ryota Murata. The all Japanese ranked bout sees Tsuyoshi Tojo (12-13-4, 2) battling against Masaki Saito (12-10-4, 3) in an interesting bout and competitive looking bout. On paper neither man is great though both are fighting at a similar and both will know a win here could open doors towards a title fight. It's also worth noting that these two fought in November, with that bout ending in a 4th round technical draw, a result both will be hoping to avoid here. The cross roads bout on this card will see former Japanese Super Bantamweight champion Masaaki Serie (25-8, 10) battle against Filipino visitor Roman Canto (10-6-2, 5). On paper this should be easy for Serie however the 32 year old has lost 3 of his last 4 and looks to be a fighter who is very much “off the boil”. Canto, who isn't a world beater himself, will come in to this bout knowing that a win will boost his career massively. Fans in the Philippines also have a card, albeit a relatively poor one in Ifugao. The most notable bout will see Noel Guliman (6-8-2, 3) battle against JC Francisco (6-10-4, 2) in what appears to be a well matched but very low level contest. On paper the man to keep an eye on is 18 year old hopeful Pedro Taduran (2-0, 2), who looks to extend his perfect record as he takes on the debuting Garry Placios (0-0), though sadly we were hoping to see Taduran takes a slight step up rather than face a debutant here.